Emtek single sided deadbolts are meant to be used on doors that do NOT have a hole drilled all the way through them. Please see our Installation Instructions for more information. - For one sided installation and appearance, no cylinder or collar is included. - Fits doors 1 3/8" - 2 3/8" thick. 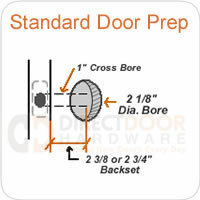 - Fits doors prepped with 1 3/4" dia. bore x 1 1/2" deep. 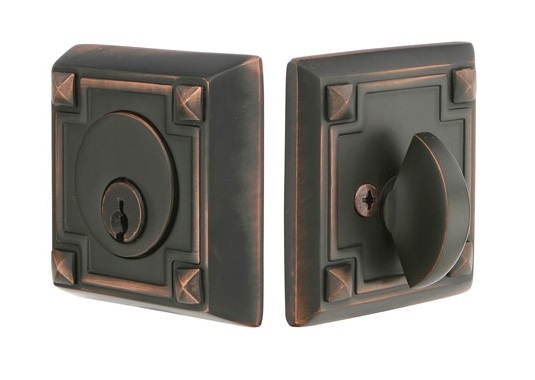 Single Sided Deadbolts are operated by Thumbturn from one side only - NO KEYED CYLINDER. Absolutely beautiful finish. Really feels good to the touch. Complements perfectly the custom doors we made from recycled materials. We used the rubbed bronze finish for main entry double doors. We choose brass & copper for interior double doors to the sun room. Perfect!!!!!! Nice quality deadbolt and looks great too.